Seen from central and northern Asia, the Sun and New Moon set together on January 4, in a partial solar eclipse. 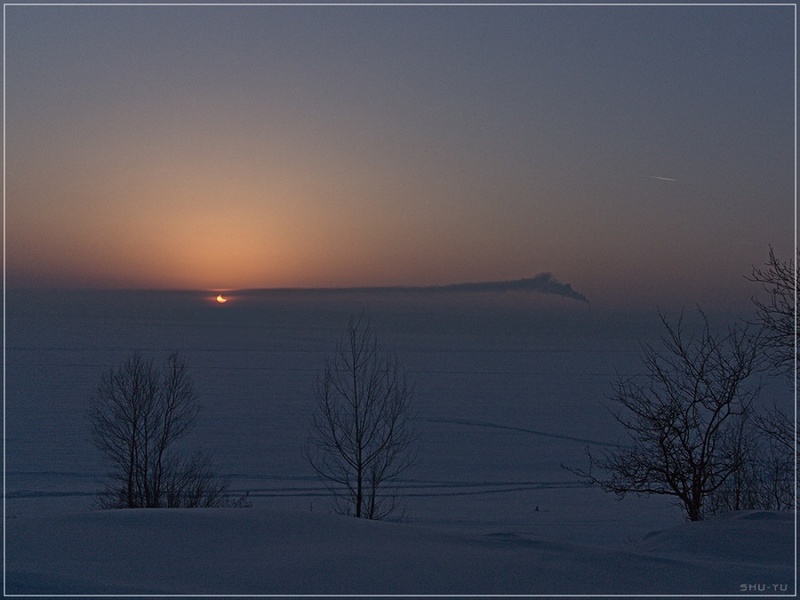 Close to its maximum phase, the eclipse is captured near the moment of sunset in this wintry scene from the bank of the Berd River near Novosibirsk, Siberia, Russia. An evocative view in fading light, the picture looks toward the western horizon across a snowy, frozen landscape. Along with offset Sun and Moon, the dimly lit sky includes an industrial smoke plume and airplane contrail. For many Europeans, the Sun and New Moon rose together on January 4 in a partial solar eclipse. Arriving close on the heels of the new year, it was the first of a series of four(!) partial solar eclipses due in 2011. This composite image documents the graceful celestial event in colorful morning skies over Graz, Austria. Beginning before sunrise, frames were taken to record the position and progress of the eclipse every 15 minutes. 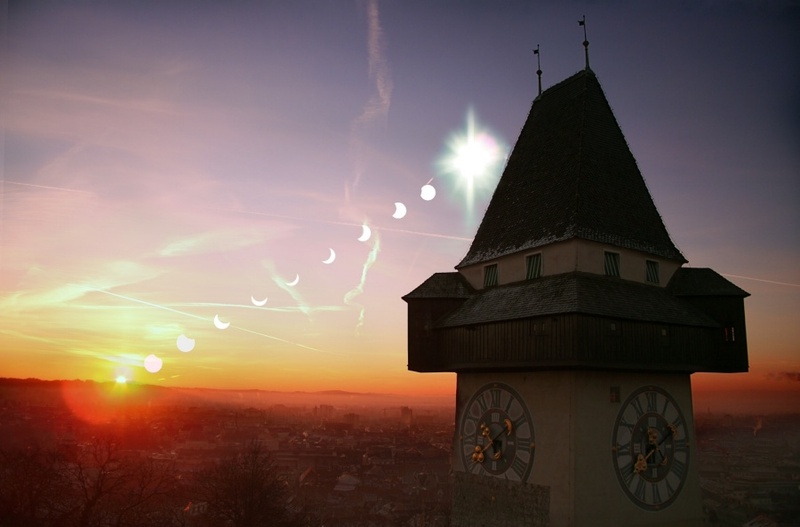 As Sun and Moon rose above the eastern horizon, the town of Graz is seen bathed in warming sunlight only partially blocked by the New Moon, spreading beneath the town's landmark clock tower. 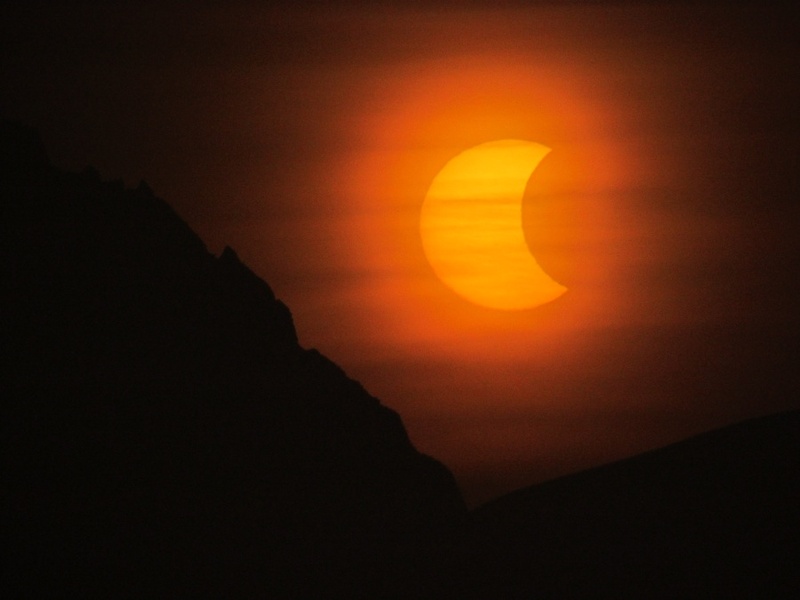 Skywatchers throughout much of Europe, North Africa, and Central Asia, were treated to the first eclipse of the new year on January 4, a partial eclipse of the Sun. 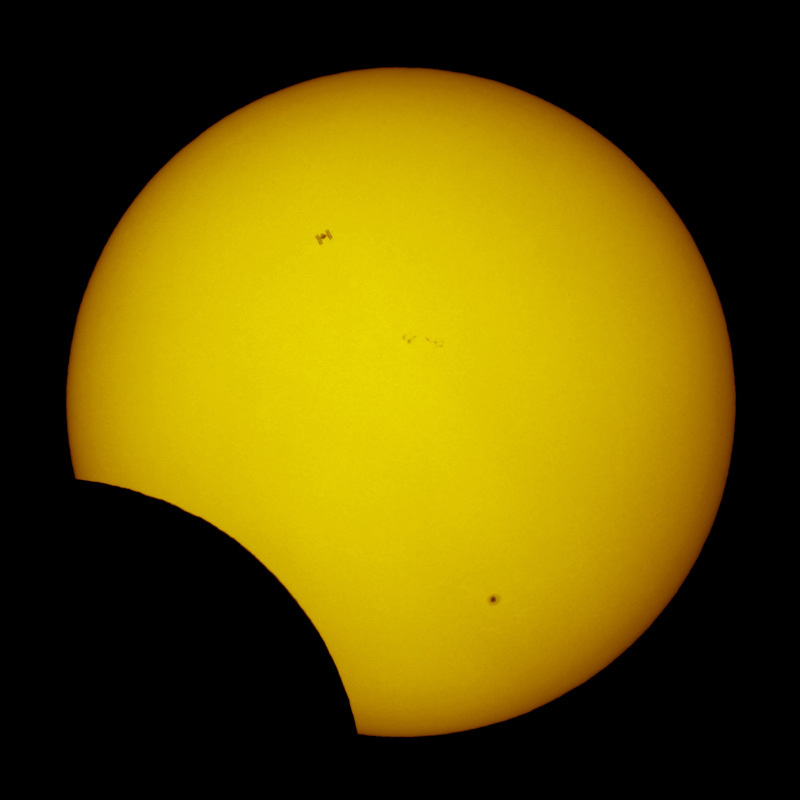 But traveling to the area around Muscat, capital city of Oman, photographer Thierry Legault planned to simultaneously record two eclipses on that date, calculating from that position, for a brief moment, both the Moon and the International Space Station could be seen in silhouette, crossing the Sun. His sharp, 1/5000th second exposure is shown here, capturing planet Earth's two largest satellites against the bright solar disk. As the partial solar eclipse unfolded, the space station (above and left of center) zipped across the scene in less than 1 second, about 500 kilometers from the photographer's telescope and camera. Of course, the Moon was 400 thousand kilometers away. Complete with sunspots, the Sun was 150 million kilometers distant. Eclipses are everywhere in this shady scene. The picture was taken on the Indian Ocean atoll island of Ellaidhoo, Maldives, on January 15, during the longest annular solar eclipse for the next 1,000 years. Tall palm trees provided the shade. 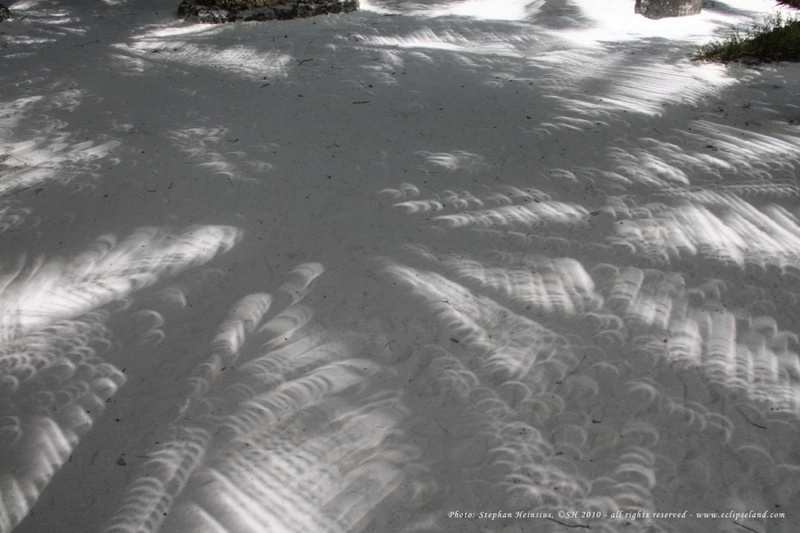 Their many crossed leaves created gaps that acted like pinhole cameras, scattering recognizable eclipse images across the white sands of a tropical garden near the beach. From this idyllic location near the centerline of the Moon's shadow track, the ring of fire or annular phase of the eclipse lasted about 10 minutes and 55 seconds. What's happened to the Sun? The Moon moved to partly block the Sun for a few minutes last week as a partial solar eclipse became momentarily visible across part of planet Earth. 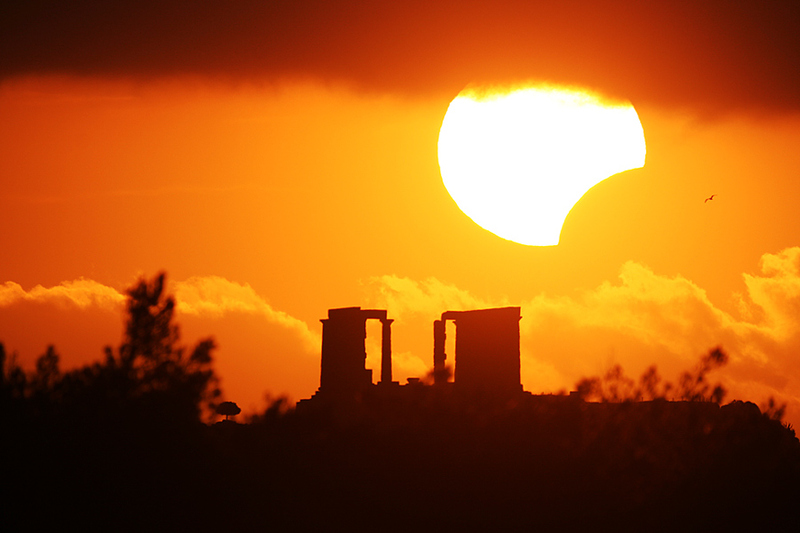 In the above single exposure image, meticulous planning enabled careful photographers to capture the partially eclipsed Sun well posed just above the ancient ruins of the Temple of Poseidon in Sounio, Greece. Unexpectedly, clouds covered the top of the Sun, while a flying bird was caught in flight just to the right of the eclipse. At its fullest extent from some locations, the Moon was seen to cover the entire middle of the Sun, leaving the surrounding ring of fire of an annular solar eclipse. The next solar eclipse -- a total eclipse of the Sun -- will occur on 2010 July 11 but be visible only from a thin swath of the southern Pacific Ocean and near the very southern tip of South America. During July 22nd's solar eclipse, the Moon's dark shadow traced a narrow path as it raced eastward across India and China and on into the Pacific. Hong Kong was south of the shadow's path, so a total eclipse was not visible there, but a partial eclipse was still enjoyed by inhabitants of the populous city. And while many were (safely!) watching the sky, images of the partially eclipsed Sun adorned the city itself. 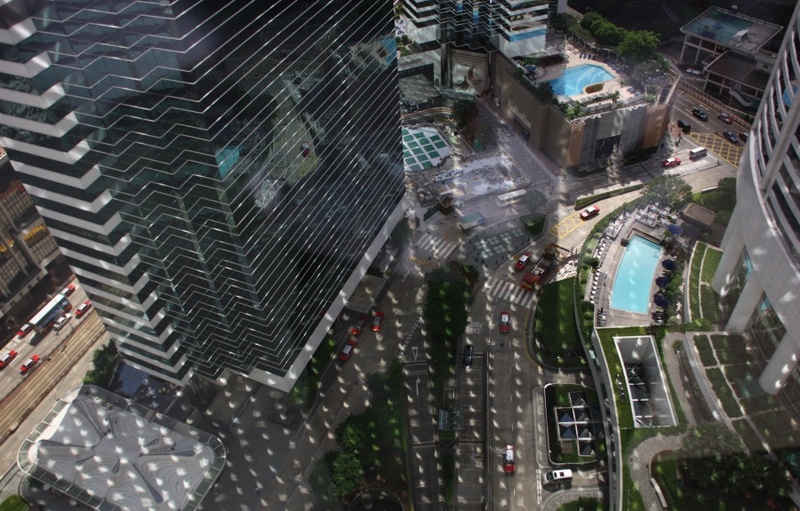 In this downlooking photo, taken at 9:40am local time, a remarkable array of solar eclipse views was created by reflection in a grid of eastward facing skyscraper windows. The photographer's location was the 27th floor of Two Pacific Place. Of course, everyone is concerned about what to wear to a solar eclipse. This is a great example though, especially for the first eclipse of the International Year of Astronomy 2009. 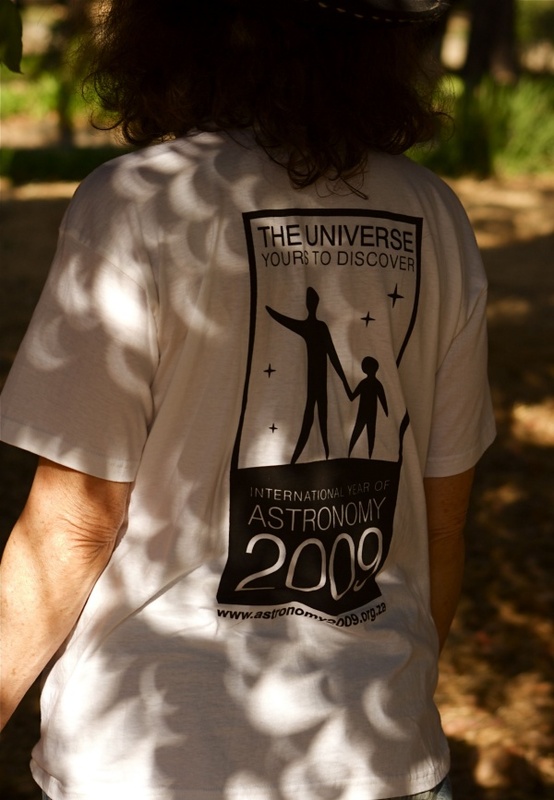 In the picture, recorded during the January 26 solar eclipse from the grounds of the South African Astronomical Observatory at Cape Town, repeated images of the eclipse adorn a well-chosen shirt. 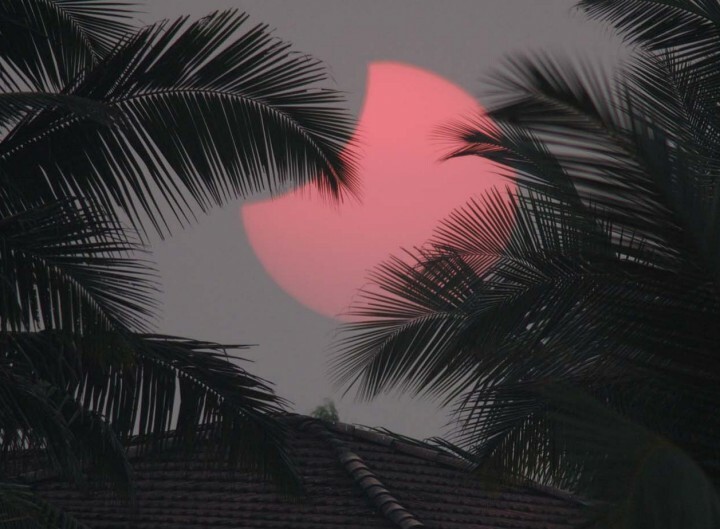 The effect is familiar to eclipse enthusiasts as small gaps, commonly between leaves on trees, act as pinhole cameras to generate multiple recognizable images of the eclipse. From the Cape Town perspective, the solar eclipse was a partial one, with a maximum of about 65% of the Sun covered. 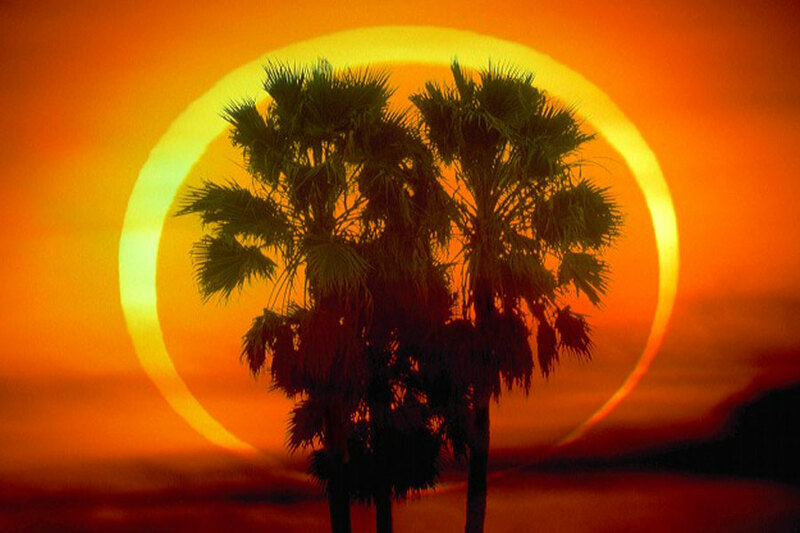 But along a track extending across the Indian Ocean and western Indonesia the eclipse became annular, the solar disk briefly appearing as a fiery ring around the silhouetted Moon. Clouds covered the eastern horizon on Monday, when the Sun rose over the expansive Touran Wildlife Reserve in northeastern Iran. Of course, on that day the Moon rose with the Sun, creating a widely enjoyed partial solar eclipse. 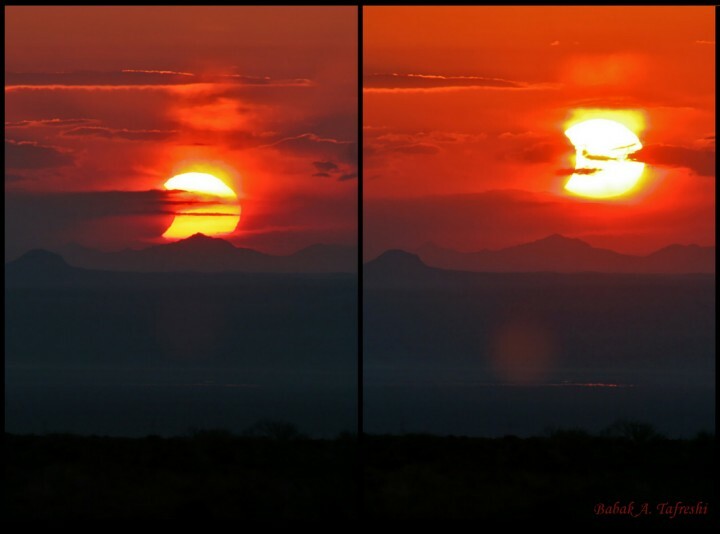 Along with a mountainous horizon, the cloud cover lent a dramatic aspect to this eclipse sunrise and made it possible for astronomer Babak Tafreshi to record these telephoto images without using a filter. Advancing north in planet Earth's sky, the Sun itself was also approaching the equinox, the astronomical marker for the first day of northern hemisphere spring and the beginning of Norouz, the Persian New Year. 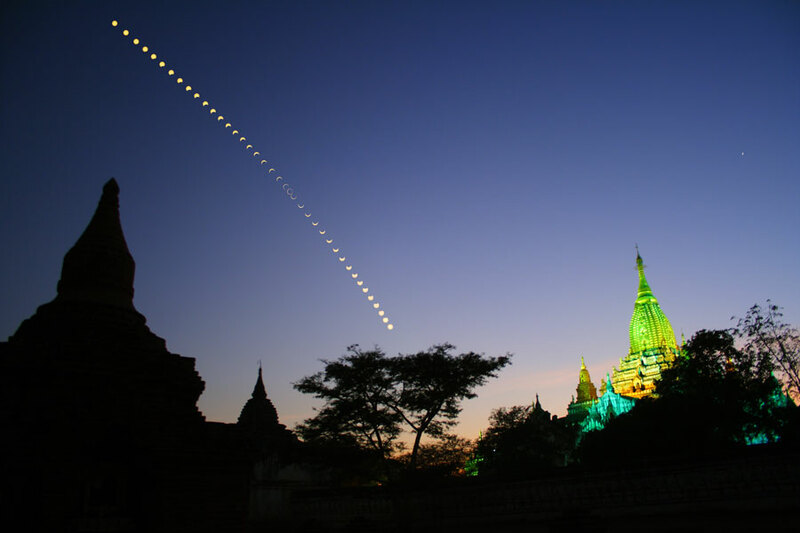 On Moonday, March 19, shortly before the equinox, locations in Asia and the Arctic were favoured by the New Moon's shadow during a partial solar eclipse. Although the view from Goa, India found the eclipsed Sun near the horizon, photographer Joerg Schoppmeyer was still able to capture this lovely image, combining celestial with terrestrial silhouettes. The next eclipse season will begin in late August this year, featuring a total lunar eclipse on August 28, and another partial solar eclipse on September 11. Compared to the March 19th eclipse, the September 11th eclipse will be seen on the other side of our fair planet, from parts of South America and Antarctica. A walk in the park seemed like a perfect idea to many enjoying a sunny October morning in Madrid, Spain. Of course, on October 3rd an added attraction was the Moon - seen in dramatic silhouette during an annular solar eclipse. 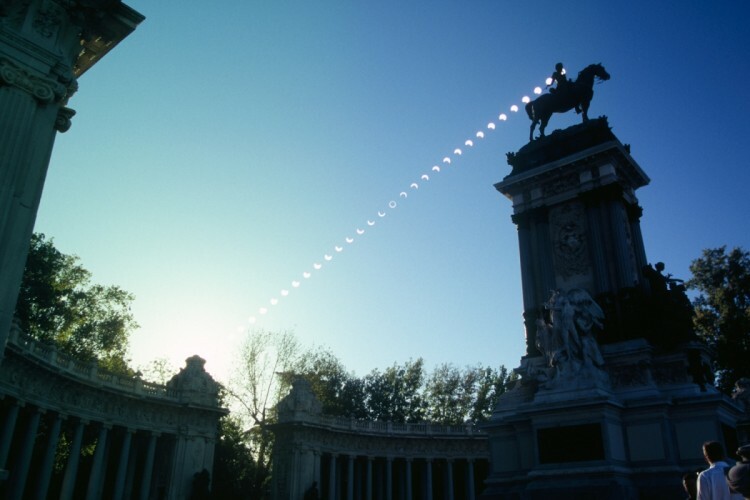 This multiple exposure sequence follows the progress of the eclipse from Madrid's monument to King Alfonso XII in the pleasant Parque del Buen Retiro. 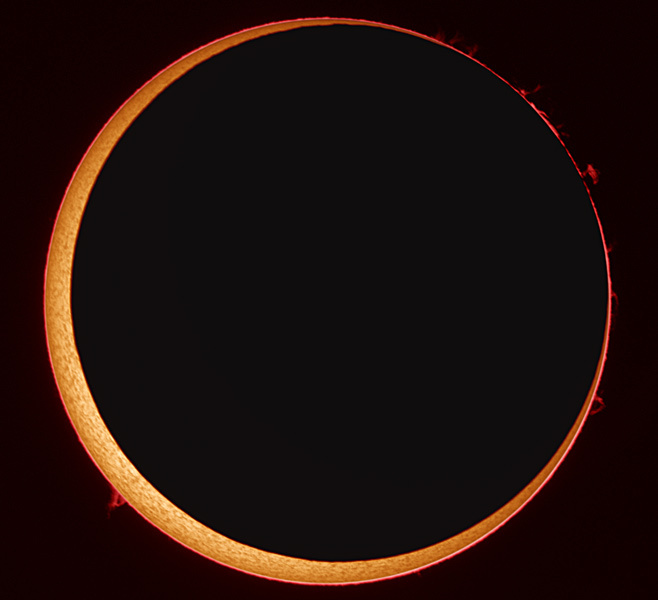 The Sun rises at the left and moves up and to the right in the picture, with the ring-like annular phase near picture center. While a partial eclipse was visible over a wide area including Europe, Africa and western Asia, the central line of the shadow track crossed Madrid. Sun watchers in the capital city basked in an annular eclipse phase lasting about four minutes. On Monday, part of the Sun went missing. The missing piece was no cause for concern -- the Moon was only momentarily in the way. 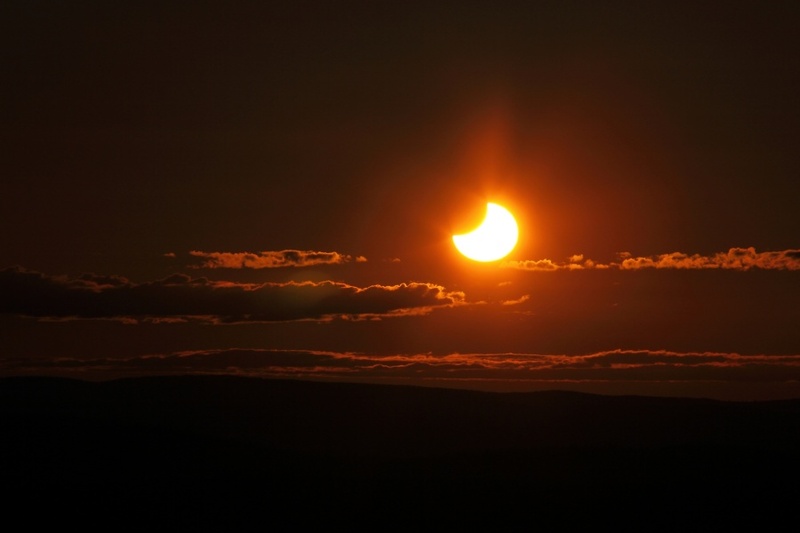 The event was not a total eclipse of the Sun for any Earth-bound sky enthusiast but rather, at best, an annular eclipse, where the Moon blocked most of the Sun. Because of the relatively large distance to the Moon during this Earth-Moon-Sun alignment, the Moon did not have a large enough angular size to block the entire Sun. Those who witnessed the solar eclipse from a narrow path through Portugal, Spain and Africa, however, were lucky enough to see the coveted Ring of Fire, a dark Moon completely surrounded by the brilliant light of the distant Sun. Pictured above is a Ring of Fire captured two days ago in unusually high resolution above Spain. The resulting image shows details of the granular solar surface as well as many prominences around the Sun.